For transmission towers of telecom companies, there is a cabinet below the tower in which their sophisticated Hardware is kept. This hardware requires a controlled temperature for which these telecom companies usually use air conditioners. The investment cost and operating cost of the Air conditioners is substantially high and the Air conditioner servicing and maintenance activity is also very inconvenient. 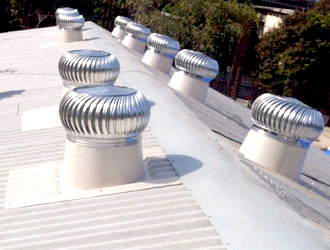 Surya Manufacturing Corporation introduced Air ventilation technology adopted in Wind ventilators. These wind ventilators operate on simple principle of Air. The hot air has a tendency to go up and cold air settles down. Thus these Ventilators can throw the hot air out and can maintain the temperatures of the cabinet without air Conditioners. These Ventilators have resulted into the savings of investment cost as well as operating costs of the air conditioners in telecom companies.